TSPSC AEE Civil Recruitment Exam 2018 Preliminary Answer key, Raise Objections Online /TSPSC AEE Civil 2017 Recruitment exam preliminary answer keys: Telangana State Public Service Commission, TSPSC has released the Assistant Executive Engineers, AEE Civil 2017 examination preliminary answer keys on April 3, 2018, on the official website. The examination for AEE in Rural Water Supply and Sanitation Department was conducted on April 1, 2018. Candidates who have appeared in the examination can now check the preliminary answer keys for the examination on the official website tspsc.gov.in. 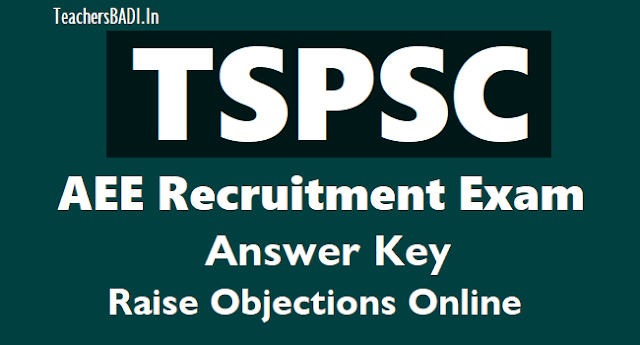 As per the official notification, the facility to raise an objection on the preliminary answer keys would be made available on tspsc.gov.in from April 6, 2018. Candidates would be required to raise objections online. The facility would remain open from April 6, 2018 to April 12, 2018. Any objections beyond the deadline would not be accepted at any cost. Step 1: Steps to download preliminary answer keys is provided below. Please note that the link for answer keys is not active yet. TSPSC had released a notification for recruitment of AEE in Rural Water Supply and Sanitation Department in November 2017. A total of 277 posts were advertised for the post. Commission had conducted the written examination on April 1. The preliminary answer keys would be released on the official website shortly.